Gourmet, elegant chocolate cakes have been sought after as the perfect dessert since the discovery of the chocolate-making process in 1764. Modern chocolate cakes have risen to a new level; incorporating unusual ingredients and using modern techniques have elevated the humble chocolate cake into a simply stunning dessert. The quest for the best tasting and most beautifully decorated chocolate cake may lead to baking at home by following a recipe, a local bakery or a gourmet cake club or mail order company. The next step is to determine the type of chocolate you need, and then buy the highest quality chocolate you can afford. Brands such as Callebaut, El Rey and Green & Black's provide the chocolate of choice for many professional pastry chefs. Keep in mind that you will have to order professional quality chocolate online or through a catalog. If you can't order online, consider Ghirardelli or Baker's brand over Hershey's and Nestle. Cover the cake with a whipped vanilla frosting and dust with espresso powder. Slice the cake laterally, and fill the middle with exotic fresh fruit. Garnish the cake with chocolate curls. Top the cake with fondant. Top the cake with freshly made whipped cream flavored with sugar and bourbon or rum. Making a chocolate cake at home can be time consuming, and the process may prohibitively intimidating to some. If baking from scratch is beyond your ability, or you have insufficient time, consider buying one from a bakery. Local bakeries are pros when it comes to making all sorts of different cakes that are considered gourmet. Elegant chocolate cakes should be available in their display case ready to go, or consider speaking to the clerk and ordering one to suit your own needs. 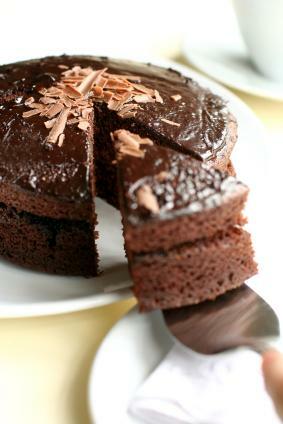 When ordering a chocolate cake, always ask if the cake is made from a mix or from scratch. Many bakeries use high-end mixes to make their cakes and charge prices as though they were made from scratch. If the cake is frosted or filled with a buttercream frosting, ask about that as well. Shortening is necessary to prevent the buttercream from melting, but the best tasting buttercreams use half butter and half shortening. Finally, consider the storage of your cake. Pastry shops keep cakes in humidity controlled environments. They should be kept cool, but not in a home refrigerator or they will "weep". This occurs when humidity causes tiny beads of moisture to form on the surface of the cake. Mail order chocolate cakes are gaining in popularity; this option allows you to select from a variety of professionally baked and decorated chocolate cakes that are delivered via overnight express, right to your door. They pack the cake securely in dry ice for shipping, and you must be home to receive it. Keep in mind that chocolate curls, shavings and decorations may suffer from shipping; your cake may not look picture perfect by the time it arrives on your doorstep. We Take the Cake is one such company that offers overnight chocolate cake delivery. A Cake of the Month Club membership makes the perfect gift for a chocolate lover; they'll send a cake each month, many of which are chocolate. These hand selected cakes usually serve six to eight and arrive moist and delicious. Clubs Galore offers a popular cake of the month membership. Made at home from scratch, ordered from a bakery or delivered to your door, delicious chocolate cakes are a perfect ending to a great meal but are also delicious any time of the day. Add a hot cup of Italian coffee, a scoop of vanilla ice cream or fresh berries to your chocolate cake and you'll have a perfectly sweet ending to your day.